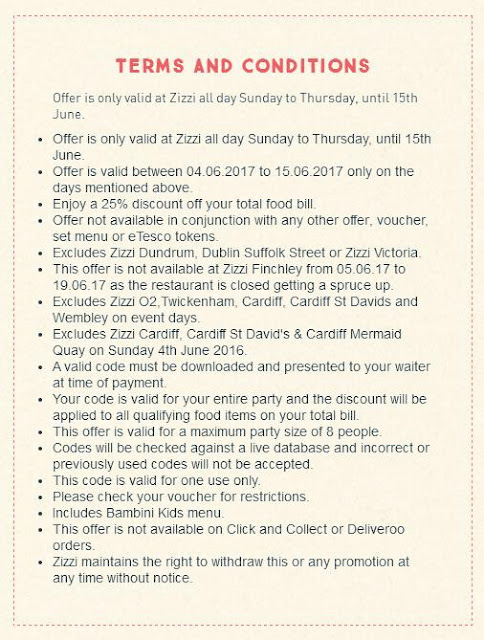 The Vegan Magpie: Zizzi offer! Hello! Lovely vegan friendly restaurant Zizzi have a tasty offer running from today, 25% off ALL food! Yum! Considering they have some great vegan option for starters, mains and pudding, this may be a good offer to make use of if you feel like eating out! Just go here: https://www.zizzi.co.uk/offers put in the branch you're visiting, fill out your details and print or show your code to your waiter. Offer ends 15th June, runs Sundays to Thursdays and there are some terms and conditions (below) as some branches are excluded. Please have a read below before you get excited about pizza!